If you’re running campaigns on behalf of someone / your customers etc, there can be situations where you want to share the realtime statistics with others but don’t want to give them access to any other area on the app. 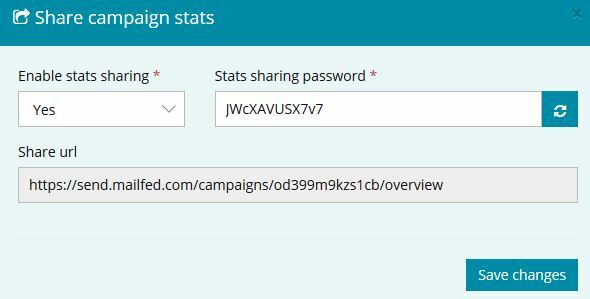 MailFed has an option exactly meant for this which allows you to share the statics of a campaign with others securely using a password. Go to Campaigns > Campaigns. Click on the campaign (i symbol) that you want to share the statistics. On the overview page, click on the “share” button located at the top right corner. Now a window will open. Flip “Enable stats sharing” to “YES” and note down the password and sharing URL. You can change the password if you want. You can now share this URL with others. They will be asked to enter the password you set on the previous step when they try to open the URL. Once they give it and press enter, campaign overview page for that particular campaign will appear.